The prophets in the Book of Mormon, who preached among ancient inhabitants on the American continent, predicted that European explorers would "discover" America, and that Europeans would settle there. They predicted that the Lord would raise up men who would form a free nation, where the Church of God could be established unmolested. "For it is wisdom in the Father that they should be established in this land, and be set up as a free people by the power of the Father, that these things might come forth" (3 Nephi 21:4). Nephi recorded that the Founders “were delivered by the power of God out of the hands of all other nations” (1 Nephi 13:19). Nephi had prophesied hundreds of years before that “this land shall be a land of liberty unto the Gentiles, and there shall be no kings upon the land” (2 Ne. 10:11). Thus, members of The Church of Jesus Christ of Latter-day Saints, or Mormon Church, view the Constitution of the United States as an inspired document, and the Founding Fathers of the United States of America as inspired men raised up by the Lord for a special purpose. In the Doctrine and Covenants, the Lord said that he had “raised up … wise men” for the “very purpose” of writing the Constitution of the United States (Doctrine and Covenants 101:80). President George Albert Smith added, “I am saying to you that to me the Constitution of the United States of America is just as much from my Heavenly Father as the Ten Commandments” (Conference Report, April 1948, p. 182). 1 Who Were the Founding Fathers? We can divide the fifty-five men who attended the Constitutional Convention in Philadelphia in 1787 into three groups. First, there were those who wanted a strong central government; they believed that the states had already demonstrated their inability to survive as a loosely knit confederation and that governmental power must be centralized or America would be split into small, warring nations as was Europe. Second, another group feared the overpowering control of a strong national government above all else and felt that the states were the only place to trust the bulk of governmental power. They believed that the federal government’s chief function should be to protect the United States from foreign nations and wanted to limit the federal government to regulating foreign trade and to maintaining an army. The third group wanted a strong central government, but also believed that the states must play an important role in the affairs of their own citizens. So significant that they must be considered separately: One, George Washington, was elected president of the Convention and therefore did not participate in the debates except as a moderating influence. The other was the aged Benjamin Franklin, whose role was to mold divergent opinions into a working compromise. These men were so revered by their countrymen that their very presence gave the Convention’s work a stamp of approval. Three absent men had a great effect because of their writings or the power of their philosophies—John Adams, Thomas Jefferson, and Samuel Adams, whose hatred for a strong centralized government had been a major “cause” of the Revolutionary War. The writings of the Founding Fathers overflow with references to God and the divine nature of man. Freedom was their watchword, and reverence for the individual was their driving principle. In the Doctrine and Covenants the Lord says that he raised up these “wise men” to establish a government which would nurture and defend individual freedom, “that every man may act in doctrine and principle … according to the moral agency which I have given unto him” (Doctrine and Covenants 101:78). The fundamental philosophy of the Founding Fathers was very consistent with that purpose. The Lord revealed to the Prophet Joseph Smith that he had “raised up unto this very purpose … wise men” to write the Constitution which he “suffered to be established and [which] should be maintained for the rights and protection of all flesh” (Doctrine and Covenants 101:80, 77). The creation of such a government was a necessary prerequisite to the restoration of the gospel. There would have been little point in the Lord’s establishing his church among people who were not free to accept it. For a thousand years he had carefully prepared the world for the restoration of the gospel, and the American Constitutional Convention was one of the final events in that preparation. 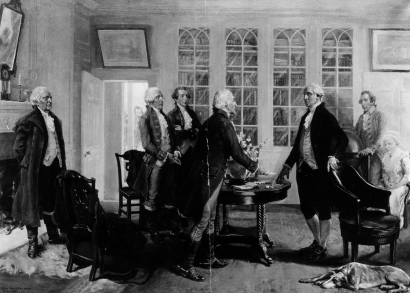 “These were the signers of the Declaration of Independence, and they waited on me for two days and two nights. … “I straightway went into the baptismal font and called upon Brother McAllister to baptize me for the signers of the Declaration of Independence, and fifty other eminent men.” These noble spirits came there with divine permission—evidence that this work of salvation goes forward on both sides of the veil. First and foremost, we must be righteous. John Adams said, “Our Constitution was made only for a moral and religious people. It is wholly inadequate to the government of any other.”  If the Constitution is to have continuance, this American nation, and especially the Latter-day Saints, must be virtuous. “Wherefore, this land is consecrated unto him whom he shall bring. And if it so be that they shall serve him according to the commandments which he hath given, it shall be a land of liberty unto them; wherefore, they shall never be brought down into captivity; if so, it shall be because of iniquity; for if iniquity shall abound cursed shall be the land for their sakes, but unto the righteous it shall be blessed forever” (2 Nephi 1:7). Second, we must learn the principles of the Constitution in the tradition of the Founding Fathers. As Jefferson said, “If a nation expects to be ignorant and free … it expects what never was and never will be” (Letter to Colonel Charles Yancey, 6 Jan. 1816). Third, we must become involved in civic affairs to see that we are properly represented. The Lord said that “he holds men accountable for their acts in relation” to governments “both in making laws and administering them” (Doctrine and Covenants 134:1). We must follow this counsel from the Lord: “Honest men and wise men should be sought for diligently, and good men and wise men ye should observe to uphold; otherwise whatsoever is less than these cometh of evil” (Doctrine and Covenants 98:10). ↑ M. Russell Ballard, “Religion in a Free Society,” Ensign, Oct 1992, 64. ↑ Russ Walton, Biblical Principles of Importance to Godly Christians, New Hampshire: Plymouth Foundation, 1984, p. 361. ↑ Edmund S. Morgan, “The American Revolution Considered as an Intellectual Movement,” in Morton White and Arthur M. Schlesinger, eds., Paths of American Thought (Boston, 1963), p. 23. ↑ Paul L. Ford, ed. The Works of Thomas Jefferson (New York, 1904–5), 9: 460. ↑ The Discourses of Wilford Woodruff, sel. G. Homer Durham, Salt Lake City: Bookcraft, 1946, p. 160. ↑ The Works of John Adams, ed. C. F. Adams, Boston: Little, Brown Co., 1851, 4:31. This page was last edited on 9 June 2008, at 15:04.